While handcuffed to a chair, Arden, the famous turn-of-the-century female illusionist, tells her story to a police officer whose own future depends on the ending, in Greer Macallister’s The Magician’s Lie. The Amazing Arden’s journey, which took her from a mountain farm, to a sojourn as a maid to one of the most notable families of the Gilded Era, the Vanderbilts, before she stole away to become the backbone of a traveling magician show, ends when her husband is found hacked to death at the close of one of her most astonishing acts. Virgil, the officer interviewing her through the night following the gruesome murder, must decide if the magician is telling the truth of her innocence, or if she was, in fact, the one who dealt the fatal blows. I’m not usually a fan of books written in first person, but because The Magician’s Lie is told from the main character’s point of view, directly from her mouth as she answers Virgil’s questions, I was caught right up in the story and left pleasantly hanging at the end of every chapter, wondering what she’d have to say next. And because I lived the past decade of my life not far from the Biltmore Estate, and spent countless Sunday afternoons of those years exploring the house’s nooks and crannies, the period of time that Arden spent working there was my favorite part of the book. 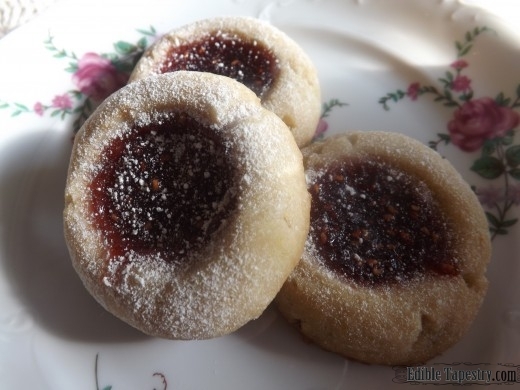 As tea and pastries have played such a large role in my visits to Biltmore, and most likely Arden’s role as a servant to guests and residents in the large home, I was inspired to create a recipe for tea cakes to go along with Macallister’s book. 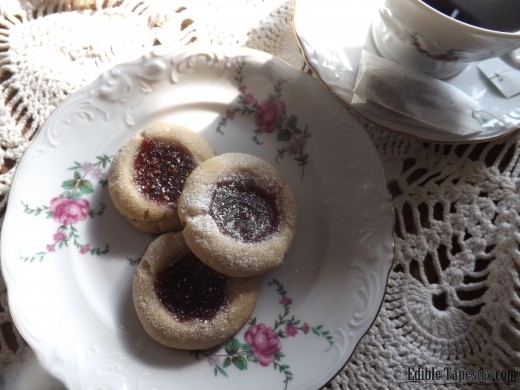 I was pleased when the little jam-filled cookies turned out so delicate and tasty that they disappeared right off the serving plate, not long after I dusted them with powdered sugar and served them up with tea. Now you see ’em, now you don’t. Ta-da! 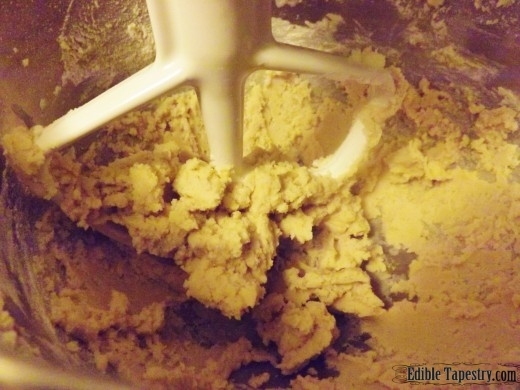 Using a mixer, cream the butter. 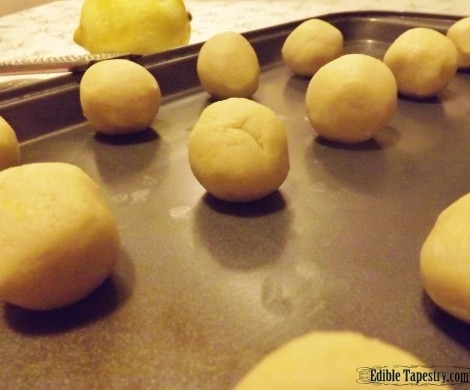 Stir in the flour, lemon zest and extract, and vanilla until a dough forms. 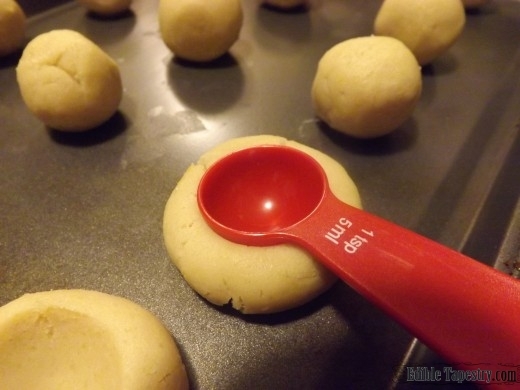 Scoop the dough by the tablespoon and shape into round balls. Make a depression in the center of each. 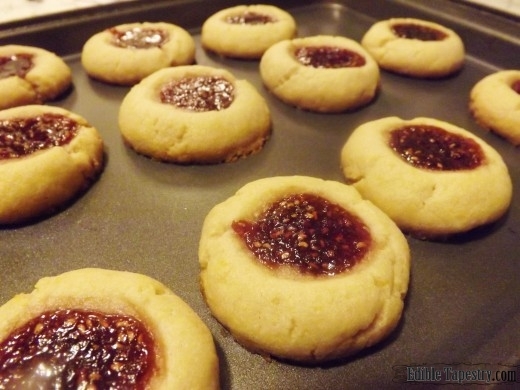 Fill each with with raspberry preserves. 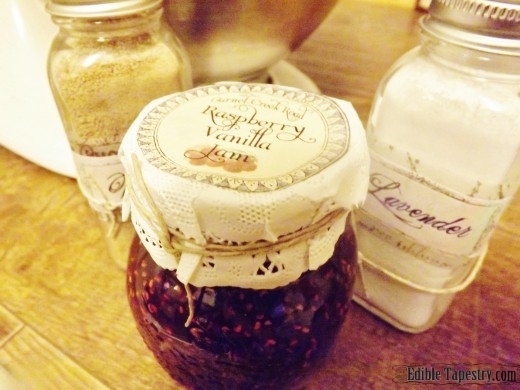 I used raspberry vanilla jam. Transfer to a baking rack and cool completely. Dust with confectioner’s sugar. Mine happened to be lavender.